The Bethune Residence is the home for approximately 260 undergraduate students, the majority of them in first year. Our residence offers both traditional style (floors 7-14) and suite style (floors 2-6) accommodation. In the traditional floors the rooms are both single and double occupancy with shared kitchenettes, bathrooms and common rooms. The suite-style floors contain both 4 and 12-person suites, each with single and double bedrooms, a kitchen, bathroom and common room. Floor plans and a virtual tour are available here. The residence is coed with the exception of the 5th floor (suite style) and the 10th floor (traditional style), which are female-only floors. The Residence Life Coordinator is responsible for the whole residence and is assisted by dons, programmers, and night porters. Residence space is guaranteed to all first-year students who meet the housing application deadline of June 1. 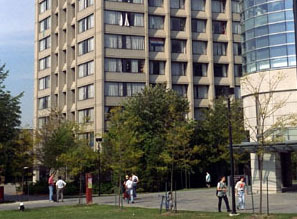 First-year students occupy the double and single rooms on the traditional floors. More info about York's residences and residence life can be found here. Note: The elevator only reaches the thirteenth floor. You have to walk up to the fourteenth. Move-In Day is Saturday September 1, 2018 for new students.